Excitement is building in Boston and New York as the throngs of Dublin supporters eagerly await the arrival of Dublin manager Pat Gilroy, along with 2010 and 2011 Players of the Year, Bernard and Alan Brogan, All-Star Michael Darragh McCauley, and several other members of the victorious Dublin football team, and of course the famous Sam Maguire Cup. The connections between the Boston GAA and Dublin are many and strong. More players than can be mentioned in one article have worn the Sky and Navy Blue of the Dubs and eventually played and settled in Boston. Amongst others, some names that come to mind over the years are 1983 Senior All-Ireland winner Kieran Maher, as well as Chris Sage, Mickey Barber, Brendan Murray, Kevin Fagan, Stephen Magill, Gerard McMahon, and most recently St. Judes man, Michael Lyons, who all exhibited their skills on the playing fields of Boston and remained to settle in the area. Pat Gilroy Celebrates after the Final Whistle. More than the names mentioned above have put their skills on display in Boston. 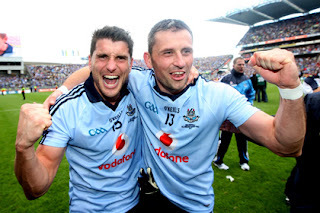 Fresh from minor and under-21 duty many Dublin greats spent time playing in Boston over the last 30 odd years, eventually to return to Ireland to go on to experience success at senior level with the Dubs. Many reached the holy grail of winning an All-Ireland medal. Dilboy Field and Canton have seen the likes of Charlie Redmond, Mick Deegan, Anto McCaul, Niall Clancy, Brian Burke, Niall Guiden, Keith and Johnny Barr play with the St. Columbkilles Gaelic Football Club, a club with strong links to Dublin football. Boston has also witnessed the likes of Joe McNally and Declan Lally, a member of the 2011 panel, both of who played with one of the areas biggest clubs, Aidan McAnespies. On the hurling front, Alan McCrabbe and Ryan O’Dwyer graced the fields of Canton with their silken skills with the Tipperary and Wexford clubs respectively. Of course Dublin is just one of the counties with a strong relationship to Boston, and we hope that the tradition continues well into the future. With plans for The Mother of All Celebrations well underway in New York and Boston, I was fortunate enough to have the opportunity to speak by telephone to manager Pat Gilroy about the upcoming trip and his connections with Boston, and reflect on Dublin’s victory and what it means for Gaelic Games in the capital. Bernard and Alan Brogan will be traveling to the U.S. The traveling party first heads to New York and will be hosted with a banquet put on by the Dublin Gaelic Football of New York on Friday night. Reaching out to the community abroad is a huge tradition in the GAA and for Pat and the players it is a chance to connect to the Irish in the States. “We’re looking forward to the trip to the States, it sounds like it will be quite an occasion,” said Pat enthusiastically. “It’s great to go. I played in New York myself and there is huge interest in the Irish community there. Its great to see the people over there, and people are delighted to see the fellas coming over, added Pat in anticipation of what the trip means to the Diaspora. The group will then move on the Boston where the recently formed Friends of Dublin GAA will host an evening at Porter Belly’s Pub in Brighton followed by a tour of the city the following day. It will be a great chance not only to enjoy celebrating with the exiled Dubs in the Boston area, but there are also friends and family to catch up with for Pat and some of the contingent. In fact, Pat is no stranger to Boston and has numerous connections in the city. Former teammates, Kevin Fagan, and Stephen Magill, have resided in the area for several years and Pat and has often met the lads on visits to the city. Pat mentioned another lifelong friend, Dessie McCain, who lives in Worcester, Mass. Their fathers were best friends growing up and the family friendship has continued to this day. Some of the players also have connections in the area, be it old club mates or relatives, so the trip represents a great opportunity to re-connect over the weekend. Kevin McManamon was the man to put the ball into the net and score the goal that would propel the team to victory. “Kevin was unlucky not to start, but we are very fortunate to have impact players that we can bring in to the game. Kevin was one of those guys and did a great job for us all year.” So, where to for this team of young players? Pat was 23 when he won his All-Ireland county medal in 1995 and waited 16 years for the second, and that as manager of the team. Pat feels that there could be a championship or two more in this young group of players if they put the work in. “The average age of the team I was on was about 30. For this team it is 23. The lads know how hard it is to win it and if they continue to apply themselves and push hard they could win a few more,” said Pat. With a 16 year gap since the last major football victory, Pat felt that winning was vital to the future of the games in the capital, especially with pressure coming from other sports. 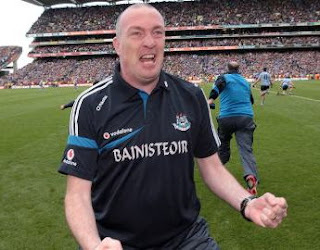 “The victory was hugely important for Dublin GAA” said Pat, “it lifted the whole city. 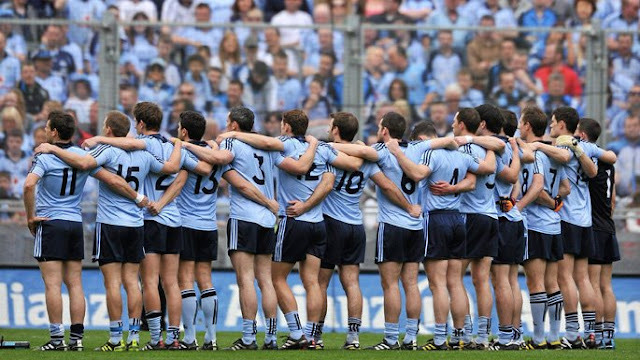 There is huge competition from other sports in Dublin and this was a massive boost not only to Dublin, but with the large population also to the GAA as a whole”. A possible signal of things to come for Gaelic Games in the capital lies in the fact that four Dublin teams in either sport reached finals this year at Minor, U-21, or senior level and Pat agreed. “The future is bright. The hurlers gave us all a lift when they won the National League and that was great to see”. Pat also remarked on the growing popularity of the games amongst the youth of Dublin, and this victory will surely add to that. Does the big man have the itch to come back and try to repeat the feats of 2011? Pat is not yet decided. “I have not made a decision yet. With work and getting a backroom team together I am waiting for some answers before I make a decision,” he said. Pat may not yet have a definite answer on that one, but something is for certain, there will be a great few days in New York and Boston the second weekend in November – especially for the Dubs! The celebrations in Boston begin Saturday evening, November 12, at 7:00 when there will be a night at Porter Belly’s Pub in Brighton. Tickets are $100 and limited to 100 people. Music by Inchicore, appetizers, and a cocktail reception. Proceeds go to the Dublin Players Fund. The following day there will be a tour of the city. Venues and times to be announced. 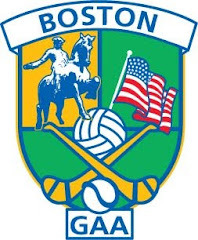 Check out our Facebook page, Friends of Dublin GAA Boston. For more information contact Sean McCormack or Rory O’Donnell. Big Celebration in Store - Sam Maguire to Boston! The Friends of Dublin GAA Boston will be bringing the celebrations of Dublin’s All-Ireland Senior Football championship to this side of the Atlantic. The Sam Maguire Cup, Manager Pat Gilroy, and players Michael Dara McCauley, Rory O’Carroll, Michael Fitzsimons, Eamonn Fennell, Paul Casey, David Henry, and Brogan brothers, Alan and Bernard, will be at Porter Bellys Pub in Brighton on Saturday November 12, from 7-11. There will be live music with Inchicore, appetizers, and a cocktail reception. The event will be limited to 100 people with a suggested donation of $100. The proceeds will go towards the players fund. Please contact Sean McCormack or Rory O’Donnell for more information. On Sunday the party will tour Boston and will be at several venues throughout the city. A schedule of appearances will be published as it is finalized. So, keep an eye out for the times and places, this is a great chance to meet the players, bring the kids for photos and autographs, and join in the celebrations! will be in Boston the second weekend in November. The Sam Maguire Cup will be coming to Boston as part of a whirlwind tour of the North East from November 11 – 14. The Friends of Dublin GAA will host Pat Gilroy, Brian Cullen, along with other team members at events in the city. The Cup first travels to New York for a night and will then come to Boston for a couple of nights. This is a great opportunity to see the cup first hand and a chance to meet some of the heroes who delivered the first All-Ireland to Dublin in 16 years. For more information please contact Rory O’Donnell at (781) 738-2783 or Sean McCormack at (617) 840-2983, or email rodonnell-1@comcast.net or sean@porterbellyspub.com.